Only two decades ago, weather was the most innocuous subject of conversation, consciously chosen to avoid sensitive subjects. “Nice day – do you think it may rain tomorrow …?” Now the subject of abnormal events and possible disasters – of rising seas, for example – is a hot topic, hotter headlines than the sensational multi-million car recalls from jammed accelerator pedals. And with modern media technologies, news flashes from on-the-spot, and satellite photographs, we may forget that most of the weather is still normal, and enjoyable. We get the impression that natural disasters are on the rise because the media know they are a good sell and have the technology to deliver into to our living room. The fundamental fact about climate change is that climates do change. Certainly abnormal weather makes the news, and hugely effects communities. The World Metrological Organization defines an abnormal weather event as one that only happens every 25 years or longer, so some recent blizzards, droughts, extreme temperatures, torrential rain and super cyclones around the globe and in China are abnormal. With the global economy now squeezing the global environment in which it sits, humans have good cause to wonder, is it us that exacerbates the wind and rain and temperatures? Of course, partly yes. We took 20 billion tonnes of fossils fuels in 2009 and burning the carbon in it turns it into 29 billion tonnes of carbon dioxide emitted to the air, and that tonnage is building up faster each year. A bottle of the gas is invisible, but in huge amounts and mixed with other pollutant gases of ugly colors, and with suspended ash particles, it acts like the cover of a greenhouse, trapping hot sunlight in that would otherwise be reflected back to space. Global Warming. But this theory is hard to prove in a laboratory, because it is only on the scale of 10 km thickness of air that the effects might take place. Skeptics laugh at the fact that some regions of the globe are being hit with abnormal blizzards, and they cannot imagine that 391 parts carbon dioxide in 1 million parts of clean air can do much damage. After all, the carbon dioxide at that small portion does not poison us. We breathe out carbon dioxide and we are okay. But apart from the basic Green House Gas effect well known, our pollutant emissions probably cause other changes. Even possibly working together accelerating climate change, and we are just starting to try to put the strands of science together that would result in gestaltic shock to see what is ahead. In a research program at Stanford University, a dozen different sciences are compared and meshed using units of exergy, which they refer to as a unifying currency. In the 2006 Energy journal classic, “Quantifying Global Exergy Resources”, Weston Hermann of Stanford opens our eyes to a simple comprehension of what is going on on Earth, and of the positive options available if we properly integrate the dozen technologies available, and that the Stanford group are comparing and sharing. But if we measure current exergy trends and do not change technologies we will see it could be like a jammed accelerator on climate change. This is the core of Hermann’s description. When the 162 PW hits the upper atmosphere, 42 PW are immediately reflected and scattered. Approximately 86 PW are incident on the Earth’s surface, and heat it up. And here is where this approach leads us to a different part of science: But first the question for that different part of science – have you ever wondered how water gets up in the sky? Because in 24 hours, globally, on average 1,400 trillion tonnes as vapor is lifted a few kilometers high. To get water vapor in the kitchen you cook it, using a few thousand joules of heat. Well, Hermann’s science gives us the answer to the question from the different view. 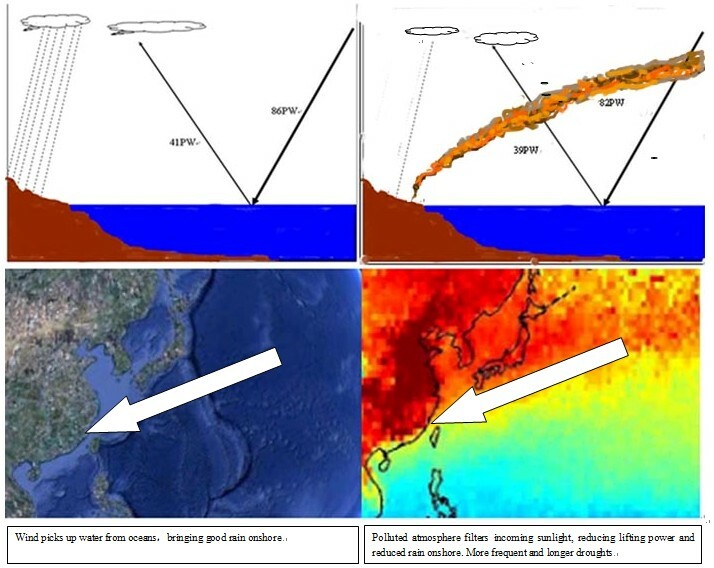 Of the 86 PW hitting the Earth’s surface, 41 PW are used up in evaporating that mass of water. The lifted water floats in the air for an average of about 9 days and about 20% of that blown over land falls as rain or snow. But the increasing green houses gases may filter some of the incoming 86 PW, leaving a decrease in the 41 PW lifting power and the result can be extreme drought. In the Figure, as an example, on a sample of ocean and land, pollutant gases reduce incoming sunlight to 82 PW and the power to evaporate to 39 PW. That filter is there constantly increasing and the droughts become more frequent and longer. This example shows the onshore wind to southern China which brings good rain and makes Yunnan in the hinterland a botanical paradise. However with atmospheric pollution intense (shown in deep red) sunlight’s capacity to evaporate water is reduced. Yunnan has experienced its worst drought in 80 years, and as industry continues to pollute, drier climate in south west China will become the norm. Another powerful fact is that the air in the day and the night sides of the globe heat up and cool down, expand and shrink, so the effect is like a dual chamber heart pump. When we pollute the fluid circulation to the extent we have, extreme swings of temperature and precipitation can be likened to giving the natural cycles palpitations. And a tiny change of 2 or 3 degrees can be a dangerous fever, as with a human body. What doctors call critical is in climate science called tipping point. Of course climate change can be viewed in several time scales. About 65 million years ago dinosaurs were wiped out by a very nasty climate change and humans were not to blame for that one. About 70,000 years ago several species of hominids were wiped out, including the branch of Peking Man, and only about 10% hominids, including of course the species we have descended from survived. Main theory is ash around the globe from Toba Volcano in Sumatra, now a very large crater lake with core center island. This is the first time humans must take some of the blame for affecting climate. But it hurts to alter habits, and it hurts more when you hurt by trying to alter habits and your neighbors continue on with high life style. Climate change is still debated, still scoffed at, and nearly everyone feels it is so gradual we still have time. If the greenhouse gases effect causing global warming was the sole problem, and if we leveled out emissions we would have maybe a century of time, and the planet and people may even adjust. But if it is true that pollutants in the air filter sunlight to the extent that there is less evaporating power, and if those pollutants change the pumping circulation, even slightly through chemical reactions and the physics of flows of different weighted, sized particles, then the combination could be a devilish synergy to accelerate climate change. We would be like the driver with a jammed gas pedal. There is recall solution. The first thing is to acknowledge with present practices the enjoyment of economic goods at the expense of environmental “bads” is, on a global scale, unsustainable. The factory manager who dismisses the problem with a “it doesn’t matter” needs to be serious about altering practices. More importantly, public administrators and entrepreneurs, who in combination drive the economy, must come to comprehend that the climate change they think they are driving slowly, could possibly accelerate out of control. Five millennia ago, sorcerers would toss tortoise shells on the ground and forecast the weather from the way they lay. Emperors hung on to the results because bad harvests or floods implied they had lost the Mandate of Heaven. We still get forecasts wrong, and the global carbon cycle and water cycles in the sea and air (el Nino etc) are far from being well understood. But not using the science we do have means we are as superstitious as the ancient sorcerers. A photograph from outerspace looking back at Earth reminds us we are a spaceship in a vacuum, and we now have the technology to damage where we live – the biosphere, as fragile and relatively, as thin as appleskin. Private selfishness combined with public environment recklessness was defined well in 1968 by Garrett Hardin in his classic essay, The Tragedy of the Commons. Now Spaceship Earth is our common heritage. On a spaceship small changes in conditions can prove fatal. No smoking allowed. By writing Scientific Outlook on Development into its Constitution in 2007, China has already changed its development paradigm in order to address the problems of the environment and climate change. Now that Scientific Outlook needs to be implemented in an integrated way. In a milestone national video/teleconference on 5 May 2010, the Premier has told officials at all level to use an “Iron Hand” in realizing energy targets, specifying the 6 main polluting industrial sectors. Exergy analysis can point the way, identify inefficiencies, and help us to be sure we do not get a jammed pedal into accelerated climate change. The saga of hearing to appoint Brett Kavanah to Supreme Court.